Google has released Chrome Remote Desktop for Android devices and is planning to release the same app on iOS in the future. CRD joins a variety of other free and paid apps that allow people to access their Windows or Mac computer from far away. Now that Chrome Remote Desktop is available for download, anyone with the Chrome browser installed on both an Android device and their main computer can use the service. In order to make a connection, the user must simply come up with a short PIN number and then enter it on both devices. Once the initial connection is made, the PIN doesn’t need to be entered every time. With almost no effort at all, you can use remote access by enabling it on your Mac or PC with the Chrome Web Store app then you simply choose your computer’s name inside of the Android app. As of writing, remote access doesn’t appear to be possible with a Chromebook, though you can use a Chromebook to access a Windows or Mac computer. Once everything is setup, your Android tablet or smartphone will look just like your regular home computer, allowing you to work on it from far away. Remote access is nothing new and it has been possible with Chrome since 2011 but the release of the Chrome Remote Desktop app on Android definitely makes things even easier. 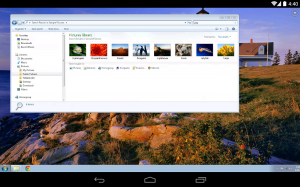 Question – Have you used Chrome Remote Desktop? If so, how did you like it? Summary: Google has released the Chrome Remote Desktop app on Android. It allows an Android user to access their home PC or Mac computer. An iOS app is coming in the future.